This rich, bittersweet Dipping Chocolate topping is the perfect recipe to drizzle over any Amish Friendship Bread biscotti recipe. You can make this recipe using a double boiler, as shown in the recipe. You can also use a microwave: combine the chocolate chips and cream in a large microwave-safe bowl. Microwave on medium power, stirring after every minute, until the chocolate is melted. 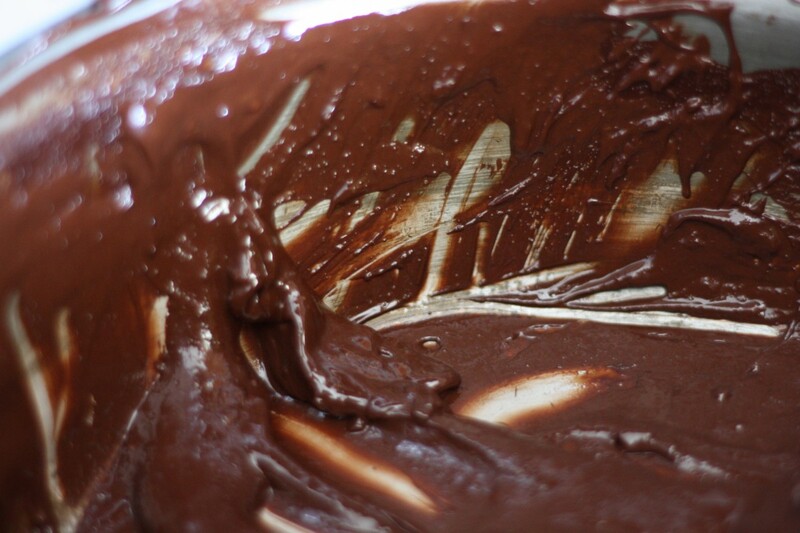 In a double boiler, melt the chocolate and cream, stirring occasionally until smooth. Does this dipping chocolate harden on the Cranberry Nut AFB Biscotti? Also, I want to try the coconut pineapple AFB and the recipe calls for a can of crushed pineapple…what size can? Thanks, so far all tries have been yummy! Hi Jackie! The Dipping Chocolate should harden on the outside of the Cranberry Nut Amish Friendship Bread Biscotti if given time to cool. The Coconut Pineapple Amish Friendship Bread calls for a 20 ounce can of crushed pineapple. You can find it on Amazon here.